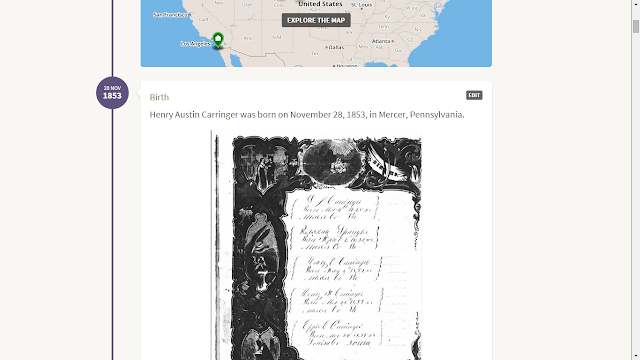 The Ancestry.com Blog posted The New Ancestry: September 28th Feature Update on 28 September 2015, which highlighted changes in the past month to the Ancestry.com website. There are 29 Events in his LifeStory from birth to death. 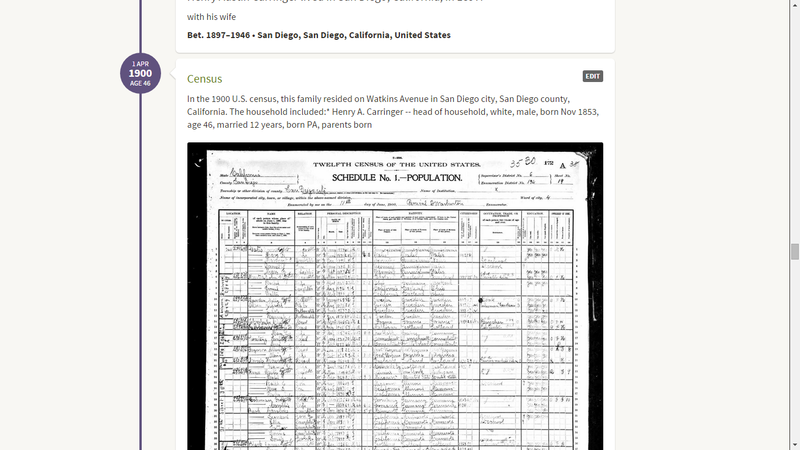 Some of the Events, with a short narrative, are automatically added by Ancestry - birth, marriage, death, etc. Others were added as Events by me - the census events, occupation events, property events, residence events, etc. When I added a document image and attached it to an Event, the LifeStory now shows the document image. 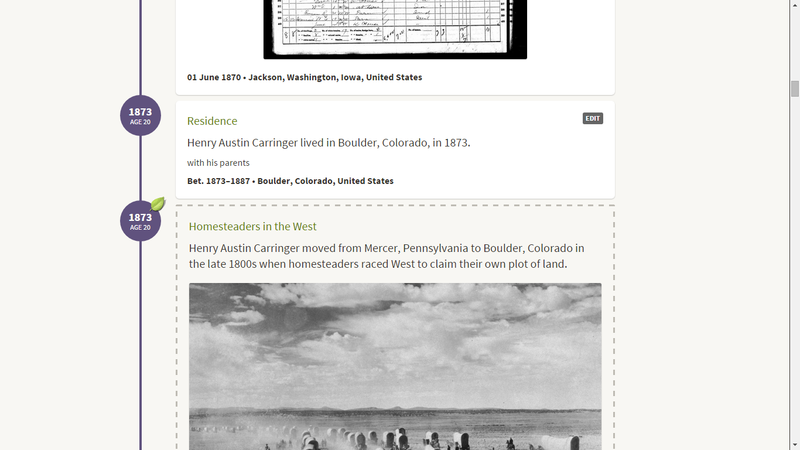 Then there are the "Historical Insights" - there are only two for Henry Austin Carringer, for "Homesteading in the West" (he didn't homestead) and "Colorado Statehood" in 1876. 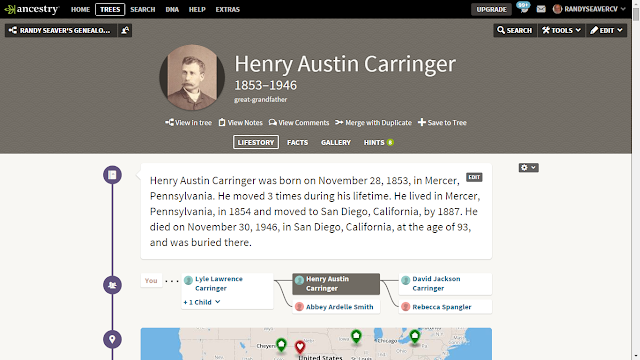 He lived through the Civil War (didn't serve), migrating to Iowa in the 1850s, migrating to Colorado in the 1870s, migrating to San Diego in 1887, living through the Spanish-American War (didn't serve), World War I (didn't serve) and World War II (didn't serve), and many more historical events. 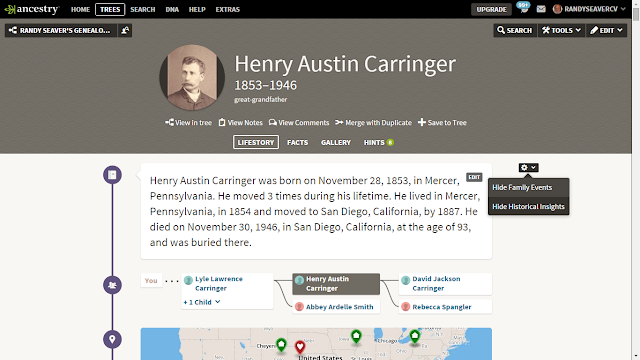 I'm glad that the LifeStory now includes all of the Events from birth to burial that I have input to the profile and that the document images for the Events are included. This is a significant change. 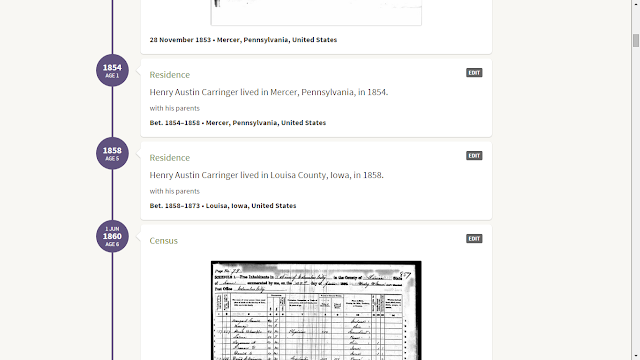 However, I tried to add a lot more to this Event - a summary of the Carringer family from the 1900 U.S. census. But the Ancestry description can take only about 255 characters. I couldn't add a line break. So a user cannot add much information to the Event description. That's unfortunate and makes it not worthwhile to even try to add family stories, research notes or event notes - mine are all more than 255 characters! I guess the family stories, event descriptions, a life sketch, etc. could be added by creating or uploading a Story in the Gallery section of the profile. I haven't done that because of the sheer volume of my Notes. Of course, only persons invited to be a Guest, Contributor or Editor to my tree can view my Person Notes. 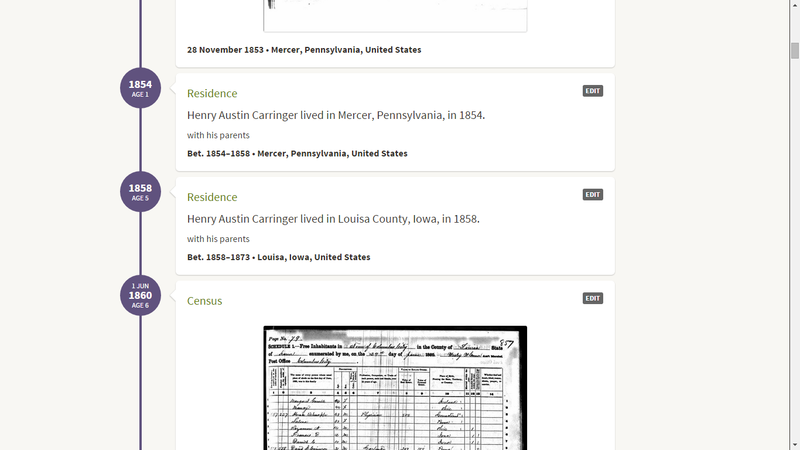 Apparently, you cannot "Hide" the Individual Events (e.g., census, occupation, property) that the user has added to the Facts list. In "Classic" mode in private trees, all invitees can see and leave Comments, but only the tree owner and invited Editors can see the Notes, which only the owner can enter and edit. In public trees, anyone able to view the tree can see and leave comments. Maybe this has changed with NewAncestry?